Take to the Lansing Waterways! Lansing has some awesome rivers. Take a ride and see the city in a whole new way. We&apos;re lucky for a lot of reasons in Greater Lansing, but one of the big things we have to be grateful for is our scenic and exciting waterways. 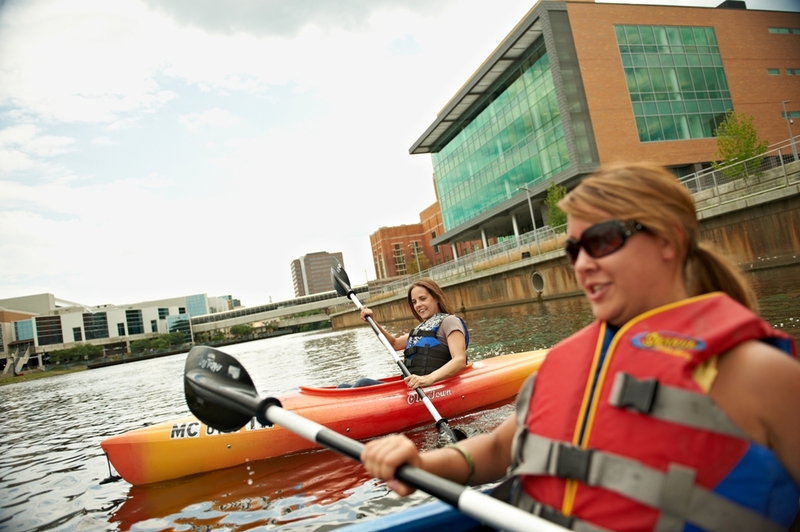 Both the Grand and Red Cedar rivers wind their way through MSU Campus and downtown Lansing and they make for a fun and exciting way to see the community. Consider this your official invitation to take to the waterways - any way you can! If you dont own a boat, dont worry about it, there are plenty of ways to hop on the water and get some tranquil water time right in the middle of our big little city. Where should you start? How about with River Town Adventures?! This awesome new kayak rental service along the river is the perfect partner to your new love for boating. Think of taking to the river and watching the bustle from your scenic and quiet spot, or while there is a big event going on, like Common Ground Music Festival or a Lansing Lugnuts game you can be part of the scene without wading through the crowds. River Town Adventures aims to provide you with a Fun and Adventurous time experiencing local waterways. Whether you are looking for another way to add excitement to your active lifestyle, are in need of a relaxing time on the water, want to see nature and wildlife from a new perspective, or simply want to experience something new in our great city, they have the adventure for you! Other than being closed Monday they are open morning to dusk most days and when you contact them to set things up, they take the time to make you aware of some things to be sure to do and not do, bring and not bring. After all you&apos;re sharing this adventure with your new friend, MOTHER NATURE and you want to, "Treat Her Like a Lady."